The Paley Center presents a screening series TV Noir: Let There Be Dark. Come with us on a journey of discovery to find the shadows and smoke, alleyways and tunnels, glorious black and white, femme fatales and hardboiled detectives who seize you by the collar and pin you to the wall in the classic 1940s and 1950s noir films you love also appear on television. Intensified, some would say, because of the intimate nature of the medium, in your home, perhaps in your bedroom . . . . Check out the schedule below, we hope to see you throughout August. And read the Paley Center interviews with the people who made the TV Noir programs on paleymatters.org, the Paley Center’s Medium publication. 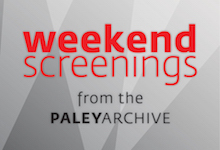 Weekend Screenings from the Paley Archive every Saturday and Sunday on the Big Screen. See full schedule. Paley Members: You can RSVP to confirm a place. Email Patrick Tekula at ptekula@paleycenter.org. • Welcome and introduction to the screening series from Paley curator David Bushman. Noir trivia with prizes! The term “film noir” was coined with respect to American cinema in 1946 by, curiously enough, two French film critics — Nino Frank and Jean-Pierre Chartier — commenting on a batch of Hollywood films surfacing in France in the aftermath of World War II, following the lifting of the Nazi-imposed embargo. Frank called these films — including Double Indemnity, Laura, The Maltese Falcon, and Murder, My Sweet — “criminal adventures,” or “criminal psychology,” defined by some unspecified combination of brutality, dark mystery, complex narrative, and verisimilitude. Poor Chartier was late to the table, publishing his essay in November 1946, three months after Frank, and hence it is the latter who typically gets all the credit. Chartier expanded the canon to include, among other films, Tay Garnett’s The Postman Always Rings Twice, clearly the inspiration for the Moonlighting episode you will see as part of our series. The screening series features a total of twelve programs, ranging from 1952—when classic film noir itself was still flourishing (many scholars point to Orson Welles’s Touch of Evil, released in 1958, as the unofficial end of the cycle)—up through 2015. To illustrate our belief that noir crosses generic boundaries, we have included not just staples like private eye and cop shows, but also sci-fi and supernatural noir, and even one example of vampire noir. In conjunction with these screenings, the Paley Center conducted interviews with some of the writers/producers whose work is featured in TV Noir. Read about Vampire Noir with Buffy and Angel writer/producer David Greenwalt; Sci-Fi Noir with Battlestar Galactica's David Eick and Ronald D. Moore; the history of Noir on TV with the Czar of Noir, TCM's Eddie Muller (president and founder of the Film Noir Foundation); detective TV comedy with Moonlighting's Glenn Gordon Caron; which can be found on paleymatters.org, the Paley Center’s Medium publication. Stay tuned for more upcoming TV Noir interviews with Larry Cohen (Kraft Mystery Theatre: Night Cry). Learn more about TV Noir at paleymatters.org!